Register on Eventbrite starting June 1st! The dates for Cleveland GiveCamp 2019 are July 19-21 (the third weekend of July). Volunteer sign-up dates will be open from June 1 to June 28, 2019, while tickets last. Some categories of Cleveland GiveCamp tickets have “sold out” in the past, so if you plan on attending, please sign up early! Followed by optional WordPress Q&A session from 2:00-3:00 pm. Please click here for Google Map to parking entrance. 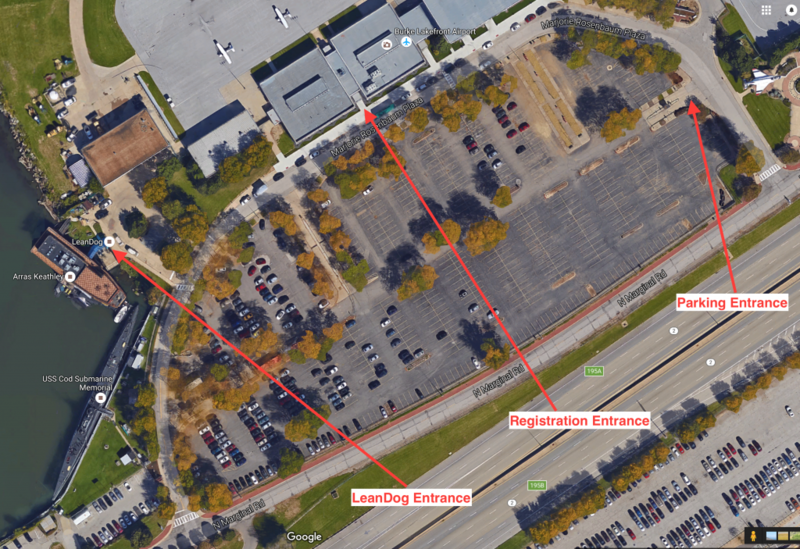 Please enter the parking lot on the east side and register at the center of the airport building. Cleveland GiveCamp uses Slack to communicate between teams and across disciplines during the event. We automatically add volunteers to the account each year prior to the event. Be sure to check out the specialized Cleveland GiveCamp Slack channels #design, #wordpress, and #project-pm groups for specific requests. Try to keep the #announcements channel open for high priority, special announcements to everyone (like food is ready). Feel free to create new channels for your team. Indians Volunteer Challenge 2018 Information — Volunteer, then go Cheer! NOTE: This is information from 2018 which will be updated for 2019 once details are confirmed. The Cleveland Indians (@Indians) and Business Volunteers Unlimited (@BVUVolunteers) have partnered on the Indians Volunteer Challenge! The have joined together to celebrate volunteerism by offering 2 free game tickets to a single game to individuals who volunteer for at least 4 hours between April 6 and August 31, 2018. Here are some directions on how to get your tickets, and some basic information. Please go to the BVU Volunteers web page for directions on how to participate. Volunteers are encouraged to use the hashtag #ServiceWithSlider at Indians Volunteer Challenge events to engage with Slider on social media. Also, please use the official Cleveland GiveCamp hashtag on all social media #CleGC and mention @CleGiveCamp on Twitter while volunteering at Cleveland GiveCamp weekend. Cleveland GiveCamp is a great opportunity to use technical and creative skills to help non-profit organizations reach their full potential. Nearly 200 software and database developers, coders, business analysts, graphic designers, marketing professionals, copy writers, video producers, photographers, social media experts and food service volunteers take part in the event on an annual basis, donating more than 5,000 hours throughout the weekend. Cleveland GiveCamp is entirely volunteer-driven, even the eight member committee which works throughout the year to plan the event, raise sponsorship dollars, recruit volunteers and coordinate event details. Volunteers represent dozens of companies throughout northeast Ohio, are current students at area universities, and even attend some of the area high schools in the region. GiveCamp helps volunteers grow as a professionals, introduces them to different people, and provides opportunities to be a mentor or be mentored. Please review the FAQ for more information. Volunteers often take the camp part of GiveCamp seriously and pitch tents at the event so they can stay close to the action. What else to expect for the weekend? Project Managers get their non-profit assignments a few weeks before the event and start planning for the weekend. The advance planning helps ensure we know what technical, graphic and content resources are needed. Project managers are one of the most important volunteer positions at GiveCamp, ensuring that the projects stay on task and meet predetermined objectives set by the nonprofit and their team during the course of the weekend. Doors open on Friday of the event at 5 pm, with a general kick-off at 5:30 pm. Early arrivals are encouraged to sign in, get familiar with the space, get their WiFi set up, network, maybe help move a few tables and string some extension cords. There is food and drink provided at the event. We suggest wearing or bringing comfortable, weather-appropriate clothes. If you can easily bring the tools of your trade (laptop, video camera, sketchbook, etc.) bring those, too. During GiveCamp, volunteers are welcome to go home in the evenings or camp out all weekend long. If you’re camping, deodorant and a toothbrush are highly (highly!) recommended. It never hurts to have a spare USB key or power strip, but don’t feel you have to go out and buy things specifically for this weekend. During the weekend, volunteers complete their project and frequently help trouble-shoot issues on other projects. Then on Sunday afternoon everyone presents and hands-off their project at the closing ceremony. All meals are offered at the event, paid for by sponsors. We encourage all attendees to make accommodations for their kids and pets during the weekend instead of bringing them to the event. Please contact an organizer if you have any questions. Everyone should have a good time, but remember, we’re ultimately there to do good work for the charities. Watch for updates on Facebook, Twitter and Instagram! We’re created a section of resource posts for volunteers to reference as they build their projects. Members of Team Y will be adding additional resources to this area throughout the weekend. Resources include WordPress Plugins, links to documentation, and suggested best practices (among other things.) Visit the Resources section. "GiveCamp is an amazing experience! I have attended every year and I have come to look forward to it. I love getting to meet and work with a new group of people on a new project each year. The LeanDog Boat and Burke Airport are wonderful spaces to work. I'll be back in 2013!"